Personal detail can deepen our understanding of Mozart and elevate our sensual experience of his music—at all ages. From the coloring book to the "shopping list" that this book presents, the twentieth century perpetuates the belief in the traditional canon composed of man and music. Bruce Cooper Clarke. 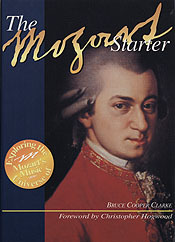 The Mozart Starter: Exploring the Universe of Mozart’s Music. Foreword by Christopher Hogwood. Bloomington: Medi-Ed Press, 1995.